the red thread: What's in your bag? You know those magazine articles and blog posts that photograph the contents of women's handbags? Yesterday when I picked Roxy up from school I asked her the same question: "What's in your bag?!" 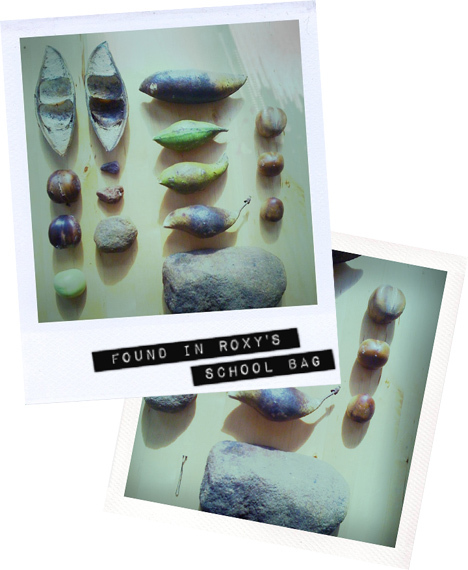 Her class had been on a bush walk and Roxy found some things that she just had to bring home: various seeds, huge seedpods and rocks. I've put a bobby pin in the second photo so you can see the scale of them... the big rock weighs nearly 2 kgs! She only weighs 20 kg herself. I don't know how she managed to carry it all, together with her lunchbox and drink bottle. Her bag was jam packed and hea-vvvy. There has since been a discussion about appropriate things to carry around and bring home. I often find crazy stuff that Roxy has slipped into my bag - she likes to collect and keep many varied things. When we are at the post office she collects all the plastic strips that people have torn off envelopes and shoves them in my bag. She's forever making origami flowers out of toilet paper (of course.. because she has to do something creative while she's on the toilet!) as little surprises that I find when I'm out. 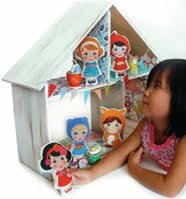 Does this sort of thing happen to you too?